il start another online log since most of the jump peoples are here now. * BW at 192lbs. 405 lift at 8-8.5/10. * 365 was surprisingly easier than i expected.. this was my first time with 365 paused reps. i got 4 good reps at set 1. stopped at rep 2 for 2nd back up set. back not as solid anymore. * all the warmup sets are paused reps up to 325x4. rests vary between 6-22mins. 24mins max if im really not feeling it yet. * supplements include micronized creatine, musclemilk/syntha6 and vitamins (multipro32x). i can do with only creatine. * 1-2mins of overall body dynamic stretch before the warmup sets. static stretch after workout after im not tired anymore. can hold until next day. no rush. * contrast bath after a 30-40 rep heavy workout. 5mins hot/cold. until my legs are red-violet. some form rolling also if i feel like it. * goal for now is repeatable 40" SVJ. a 405x6 2-4sets would be enough leg strength for that. hopefully. then back to shock plyometrics. * workout pattern: 2-4 reps on top heavy set.. and 4-6 reps on back up paused sets (40lb less than top set). legs get bigger with 6reps and caloric excess. top set used for potentiation, neural gains or something and just pure show of awesomeness. most of the gains happen with the back up sets. IMO. * lack of multiple back up sets means im tired and not really planning on progressing.. just stabilizing/maintaining strength. a workout with sub 20 total work reps is a deload. i can dished out a 6x8sets on my strong days. * jump workout includes jump rope drills - single/double leg, wave loaded jump squats 55/95lb, SVJs and 3-step VJ, some split squat jump/tuck jump/barrier jump..and shock plyometrics. - Fell behind by a week. will attempt 405x4 2-4 sets on Tue Dec 14. * If i get burned out with 405 4x8 and not get to 405x6, then $hit.. its happening next month then. * If everything goes to plan.. then by 2011, il be maintaining strength with 425x2-4 (2.2BW load) and trim BW to 192, plan a good depth jump cycle, wave loaded jumps and more sprint work. what up brah!! good to see you hear. * BW 192lb. rep 4 of 405 an 8.5-9/10. first 2 reps were 8/10. * gym closed at 8pm. was planning 6-8 sets of paused 365.. ended at 3sets. ran out of time. * set 3 rep 3 of paused 365 not very explosive.. stopped at 3reps. could have done more double on paused sets.. its ok. could have burned myself out. * 405x6 is at least 3-4 weeks away if ride my supercompensation curve correctly, if i burned myself first before peaking.. then trial and error again.. multiple 405x4s and then 405 +6.. then its 405x2-4 with depth jumps and more speed work. * not recovered from weds squats. rep 3 of 405 is an 8.5-9/10 lift. rep 4 would have been killer for lower back. * skipped back up paused sets. * warmup sprints got me sweating on whatever else i did after it. depth jump performed for quick transitions, not max jump attempts. Your SVJ is awesome and so is your strength, I just had questions about a few things. At what age were you able to do a 300 pound full squat paused rep? I am just wondering if you were naturally strong...What's your running vertical jump at? How long have you been doing vertical jump training? 300lb paused reps at high 20s age. cant say naturally strong, but i was thicker than average. running jump is a +2-3 inch but rarely.. usually just 1-2. heavy squats cycles affect RVJs more. nice job on dj's/sprints, i'd personally focus more on the first few steps on the sprints.. you're easing in then hitting some hard strides towards say ~7 yards (i forget, should have counted).. i'd try and generate that power on the first through third steps.. turn on maximally from nothing. * i was feeling really fresh and strong approaching the warm up sets.. 365x2 warmup was also paused. it was easy and form was smooth, solid and just right. must be the depth jump effect again. squats get stronger when i do light to moderate plyos. * 405 1st set.. first 3reps were 8/10 lift. 4th rep was a goodmorning at the 1/4 position. 9/10 lift. got very drained after that. got light headed and sleepy also. 24mins rest. * 405 2nd set. 8.5/10 lift. did not push it because i plan to make more sets on the backup paused sets. * i was expecting an easy 365 4repsx6-8sets.. i ran out at 3rd set. * strength curve probably getting ready to go downhill. i did the same workout last week and made no progress today.. aside from the paused 365x2 on warmups. * will do 405x2 on sunday. better diet and rest again.. and wed next week is another shot at 405x4 2-4sets. * im already a week late based on my initial december plan. i messed up on sundays 405x3. should have stopped at 2 reps.
nice work man, why you lift a day early though, still lifting on sunday then ? Hey Kingfish, you told me to get some lifting shoes. 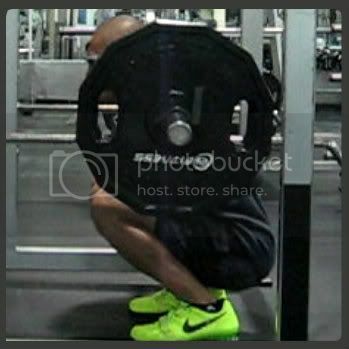 When you switched shoes, did you immediately squat better or have you had to get used to it? still lifting on sunday. will make sure its a deload workout. probably just stop with warmup sets, or a single 405x2. plan is to get as much days off until wed next week while eating a lot more and resting better. i immediately narrowed my stance to shoulder width.. and squat same weight with better depth and a more comfortable form. im mostly lifting 6-8reps on 10RM weight at that time so i dont know if ud get the same effects if you use near max weights. How far do you point your feet out and why? Did u always squat with this technique? How long has VJ been your goal?